Upon dropping the needle on the Sef and His Playboys album (yes, I too noticed the cover picture was exactly the same as the one on Bob Mickey's LP), I thought this was going to be your standard issue vanity release polka record, from an un-Googleable artist. But holy cats was I wrong. 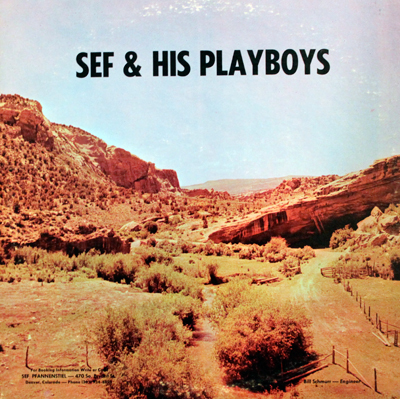 Thankfully I kept listening, and soon realized ‘ol Sef and His Playboys is probably my best surprise find – ever. I am hard pressed to find words to describe this album. It’s jazz, it’s polka – heck, it even has some psych vibes (not joking). Four songs into side one, and Rod Harkman jazzes it up on "Pennies From Heaven" – oh my God I’m diggin’ that cordovox! The second cut, a cover of Herb Albert and the Tijuana Brass “So What’s New,” and I have no words. If you had been a fly on my wall when I first heard this. WOW. Rod Julkowski is channeling some lite psych on his keyboards. Throw in some Louis Armstrong ("Song of the Island"), and Carpenters ("Close to You") covers, for good measure....and the song that inspired the theme to Star Trek, "Out of Nowhere." OK, enough gushing. I’ll stop now. The runoff indicates it was recorded in 1972. I did find a Severin Pfannenstiel who passed away in 1988, but can’t get confirmation if he is one in the same.